“I’m now not just mtoto wa mama; but a man!” Those are some of the choice words by Award-winning singer Bahati for bloggers prying into his family affairs. 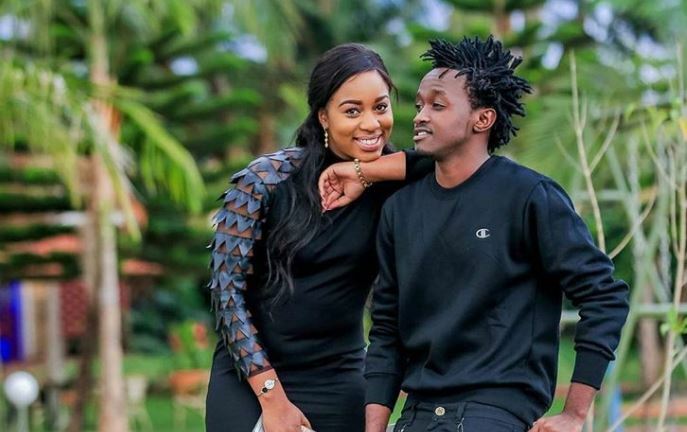 The gospel musician and his wife, Diana Marua, are barely a month into becoming parents and there are unverified claims that Bahati may have conducted a secret DNA test to verify their daughter’s paternity without the mother’s knowledge. As the story goes, the DNA results were dropped at the flats where Bahati stays and left in the custody of the person who was at the gate, because there were explicit instructions not to drop it at his house. When Bahati got back home on Thursday night last week, he was allegedly given the letter and that is when all hell broke loose. “People kept asking what was in the letter because what ensued was an argument between Diana and Bahati. Even a pastor and his former manager were called to mediate,” a source was quoted by a local blog. The prying into his family affairs has clearly irked Bahati who fired back on social media telling off the controversial blog. “RESPECT & STAY AWAY FROM MY FAMILY!!! – I know You’re Doing all this to gain readership but I think you are going too far with this if You can wake Up Create a Story and Publish Just to make headlines. I have lots of Respect for Mature Media And it’s Okay to Discuss Bahati & My Music in any Forum, but Family is Sacred don’t go there for the Sake of Making headlines. Just to remind you that am Now not just mtoto Wa Mama; but a Man and let this be the last time you’re Riding With my Family on a Blog without proof. Let my Wife Recover at Peace and don’t dare write Nonsense about my daughter,” wrote Bahati. In another post, Bahati stated that his family comes first.